The mobile app developed for the Mile of Music festival was highlighted in a video during a presentation at one of Microsoft’s largest global conferences in Toronto last week. Skyline Technologies of Appleton, Wisconsin, shares how the app it created has been so successful in enhancing the festival experience for attendees and organizers. This app is all about creating a great experience for everyone involved with the festival and we’ve developed some great partnerships that have made it possible to do that. 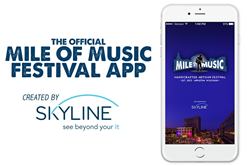 Wisconsin-based Skyline Technologies was recognized at the 2016 Microsoft Worldwide Partner Conference (WPC) in Toronto last week for the innovative mobile app it designed for the Mile of Music festival. The app was featured in a video during a general session by Mitra Azizirad of Microsoft as it exemplifies how a broad set of technologies were integrated to create an effective, user-friendly solution for thousands of event-goers on multiple smartphone platforms. Microsoft Corporation hosts WPC each year as an opportunity for more than 15,000 of its worldwide partners to share best practices, check out the latest product innovations, learn new skills/techniques and see the product successes others are experiencing. In providing information technology and business consulting services to several industries since 1992, Skyline – an associate-owned firm located in Appleton – successfully developed the festival app as part of two key partnerships. These include Skyline’s collaborations with the growing grassroots Mile of Music festival (also referred to as Mile 4 this year) as well as with Xamarin (now owned by Microsoft) – the cross-platform software used to build the app. The mobile app was designed as an easy, convenient way to connect festival attendees to the music experiences – from scheduled performances to educational workshops – Mile of Music offers during its four-day run in Downtown Appleton. With the festival set to return August 4-7, the app will again serve as an informational resource in helping visitors choose among the 800-plus live performances from 240 emerging artists as well as a wayfinding tool as they navigate more than 70 venues. To accommodate all smartphone users at Mile 4, the latest version of the mobile app is being released for iOS, Android and Windows Phone. Among the enhancements to benefit festival organizers is low-power Bluetooth sensor technology. It will capture more data on attendance patterns and density throughout the mile-long festival radius and give organizers insights on traffic flow so they can leverage social media efforts in less-frequented areas. “This app is all about creating a great experience for everyone involved with the festival and we’ve developed some great partnerships that have made it possible to do that,” Weckop said. The Mile of Music is an artisan, original music festival that kicked off in August 2013. In its first four years, the festival has quickly flourished. It brought 200 bands and solo artists to Downtown Appleton in 2015 alone, with 750 live music sets performed. The collaborative event was co-founded by Appleton marketing executive Dave Willems and Appleton/Nashville-based national recording artist Cory Chisel, with support from more than 100 community organizations and sponsors as well as 300 volunteers. For more information and to download the app, visit http://www.mileofmusic.com.